From July 12th to the 16th, Bill Fisherman and I had an adventure together. Bill lives in Anchorage, and I in Gig Harbor, Washington, when we are off island. 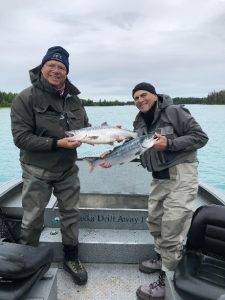 Bill invited me to join him on a trip on the Kenai River in Alaska, fishing for sockeye, or as they’re called in Alaska, red salmon. I flew into Anchorage the afternoon of the 12th. Bill picked me up at the airport and we drove down to Soldotna, Alaska. Bill had spent many years fishing with Jeremy Anderson at the Silver Tip Fishing Lodge there. Bill has literally become a surrogate grandfather of Jeremy, his wife Jenny, and Jenny’s family. We fished for three days. On the first day, with four of us on the boat, Bill masterfully caught a daily limit of three gorgeous red salmon. He really showed his stuff to the rest of us! On day two, each of us caught a fish. One of the highlights of the second day, which happened to be Shabbat, was that Bill sat in with me on my Don Armstrong-led, weekly intermediate and advanced Hebrew lessons via telephone call from Sof Ma’arav. I joined my classmates Lorna Holmes, Fran Margullies, Carolann Biederman, Hefcibah Martin, Linda Lingle, and Sandy Armstrong. Sometimes I can even hear Seth Markow enjoying his afternoon nap during our class! It’s really fun to share the experience of the class and hear everyone’s knowledge seeking, enthusiastic voices! The next day, Bill and I had our friend and lodge owner, Jeremy to ourselves. We had to wake at 3:00 am, as Jeremy picked us up at 3:45 am. We got down to the boat about 4:00 am. Fishing is the only sport where you can show up at four in the morning and still be an hour late! Fortunately, the other boat already in the water didn’t follow us. 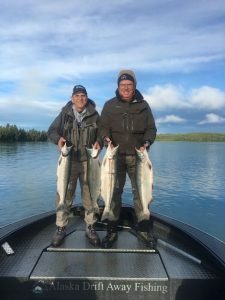 Jeremy took Bill and I way up the Kenai River to the lake where red salmon were rising and, with Jeremy’s boat handling expertise, we were each able to catch our limit of three beautiful sockeye salmon. Bill was even fortunate enough to lose several on the way to the boat, so he was able to have a longer experience actually “catching” fish. Bill and I got to know each other a lot better on this trip and we look forward to repeat adventures.